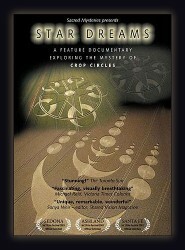 A 85 minute documentary which shows the circles themselves for all to see and presents the top crop circle researchers. Investigating the over-all assumption of hoaxing, balls of light, sacred site connection, media and people's reaction to the phenomena, and outlining the basic understandings arrived at so far. Images of the major crop circles, interviews with top researchers and a narrative line dealing with the mystical aspects of the phenomenon. Many are now coming to believe these mysterious symbols, appearing all over the planet (more than 11,000 since 1980), are a communiqué to humankind allowing a greater human consciousness to emerge. They are here to offer humanity at this time, an opportunity for an expanded consciousness and an understanding of how the world works in the larger context of the inter-galactic community. Science and media have not given the phenomena it due consideration. Now is the time for a careful re-consideration based on the information and insights gained by the many researchers in the field. "Crop circle explorer landing in Edmonton."